In Eating Forward™, Sandi teaches you her system as never before, along with 10 more complete weeks of deliciously simple meals. Her common sense approach takes dinner off your mind. Save time, money, health and peace of mind! Sandi Richard’s EATING FORWARD™ system is helping thousands of families love dinner again. Sandi's passion is to bring families back to the dinner table, while improving the relationships in the home. 500 Calories CAN Change Your World…And Taste Great Too! The Value Menu Meal…Convenient or Costly? Eating Forward™ is really about addressing the issues that are keeping us from the dinner table, the things no one is talking about. Sandi focuses on what Eating Forward™ is all about while helping to make dinner easy! Reduce stress, save money, love dinner and be healthy, that’s whatEating Forward™ is all about! Sandi provides you with easy, doable ways to overcome the obstacles in your path, because she understands that life stands in the way of good intentions. Learn how to get dinner to fit your life, free up some time and create those special dinner table memories. Remember, dinner isn’t just about food, it’s about family! 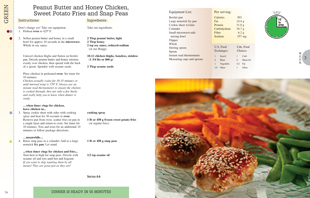 Eating Forward™ teaches you to create your own Eat Sheets™ using the recipes you love. Eating Forward™ will be released in October 2010. Eating Forward™ contains all the key components which make each of Sandi Richard's books national bestsellers. Eating Forward™ has ten nutritionally balanced weeks of five dinners, including completed Eat Sheets™ (grocery lists) for each of these weeks (in each book and printable off our website).